One user told us: “Guys, if you really want to make my life easier, you would figure out a way on how to save me from using a bloody touchpad in your tool”. So we did exactly that. 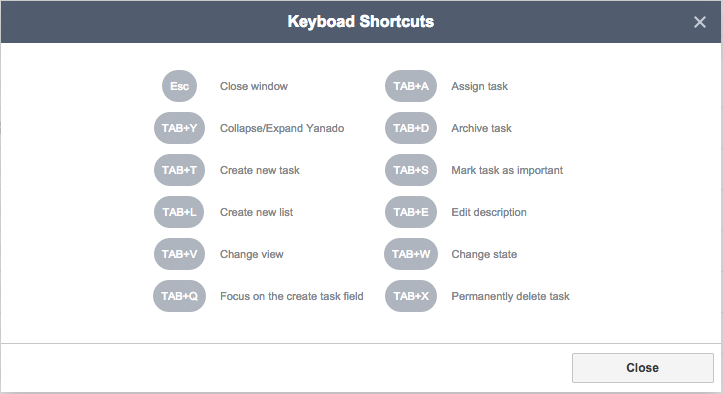 We implemented keyboard shortcuts for all you speed masters and productivity ninjas out there. At the bottom of Yanado you can see the most used shortcuts. Check the image below to see where they are in case you haven’t noticed them already. If you press on the little keyboard icon, you will see the full list of implemented shortcuts. We are still working on several more shortcuts (reminder, proper cursor moves with arrows) and those, if everything goes like we planned, we’ll be releasing this week. They were supposed to be ready for this release but, to be honest with you, we had no idea how to implement them. Now we do! Feel free to give us even more feedback. After all, we’re making this tool for you!